Sometimes there’s such a surfeit of bad news that it gets impossible to decide where to begin. So let’s begin the tale of the year when humanity got a definite idea of how long it has to live on this planet with some missives from the world of science. Typically, autumn and winter are a busy time for climate scientists across the world. This is the time when they tabulate their year-long data and sit down to prepare reports, backed up with reams of data and helpful graphs, detailing the state of the world’s climate. The reports that have emerged, and are still emerging, make for grim news. There’s no easy way to put this. We’re losing the battle with climate change. Currently, the world is 1 degree Celsius warmer, on an average, than it was at pre-industrial levels. According to the biggest of this year’s reports, the United Nation’s Intergovernmental Panel on Climate Change (IPCC) report that was released in October, at current levels of carbon emissions, the world is on track to get warmer by 3-4 degrees Celsius by 2100. What does that mean? To understand, we must look at the changes to the planet that’s being caused by a “mere" one degree of warming. Tropical hurricanes and cyclones are much stronger than before and are intensifying faster over open sea, and hovering longer on land. Droughts are record breaking. In January, there were forest fires in Sweden, within the Arctic Circle. Wildfires in western US and the fires in Greece have been the most devastating on record. Rainfall has become unpredictable and more intense, leading to unprecedented flooding, as we have seen this year in Kerala and Meghalaya. According to the World Meteorological Organization’s (WMO) provisional statement on the State Of The Global Climate In 2018 report, this year is on course to be the fourth warmest year on record. That’s not all. The past four years have been the hottest on record, and the 20 warmest years on record have all been in the past 22 years. According to this report, at current levels of carbon emissions, 2100 will be warmer by 3-5 degrees Celsius. This year, Arctic sea ice, which achieves its greatest extent in March, was the third lowest on record. In September, when the ice is at its lowest extent, this year’s minimum was the sixth lowest. There were 70 recorded tropical cyclones in the northern hemisphere, against a historical average of 53 every year. While releasing the report, Petteri Taalas, the secretary-general of the WMO, said, “We are the first generation to fully understand climate change and the last generation to be able to do something about it." 2018 marked exactly 12 years since climate change burst onto the public consciousness with the release of the documentary An Inconvenient Truth, fronted by the US politician Al Gore. A vividly made movie, it sent shock waves around the world with its gorgeous visuals of our planet in decline: a terrifying vision of the Earth heating up, polar ice caps melting, seas rushing into our cities, wildfires devastating the land, the Earth’s river systems dried up, the world turned to dust, uninhabitable. Nothing, since probably the voice of Orson Welles reading out The War Of The Worlds on the radio in 1938, had caused so much panic. But that was science fiction. This was scientific reality, a terrifying one. With a 3 degrees Celsius rise by the end of the century imminent, we’re firmly on that path. The IPCC report, which was sanctioned by the landmark Paris climate Agreement of 2015 signed by 195 countries, fulfilled its mandate by collating over 6,000 separate scientific studies that examined the possibility of limiting global warming to 1.5 degrees Celsius from pre-industrial levels by 2100. Think of it as making the best of a bad deal. The premise of the IPCC report is this: every fraction of additional warming will worsen global climate on every parameter imaginable. However, if we somehow miraculously manage to limit the warming to 1.5 degrees Celsius, then that would mean that world would lose 70-90% of its coral reefs. By comparison, with a 2 degrees Celsius rise, this would mean the total wipeout of all oceanic corals. At 1.5 degrees Celsius, global water stress would be 50% lower than at 2 degrees Celsius. A 0.5 degree Celsius difference in warming would put hundreds of millions of extra people at risk of climate-related poverty. At 2 degrees Celsius, extreme summer heatwaves, as seen in Europe and America and the rest of the northern hemisphere, which in turn led to the wildfires, would become more common. That level of warming would result in an additional 10cm of global sea level rise, affecting an additional 10 million people in 2100. The world’s oceans are something of a global thermometer, the best way to determine the gradual warming of the Earth. Higher sea temperatures, said the report, would mean increased acidity and lower levels of oxygen in the seas. A 2 degree Celsius rise would not only effectively kill off corals, but deplete marine fish stocks by 3 million tonnes. At 1.5 degrees Celsius, this loss would be limited to 1.5 million tonnes. What’s worse, since the Arctic is warming at 2-3 times the global average, complete sea-ice free summers would be the norm once every 100 years with a 1.5 degrees Celsius rise. This would change to sea-ice free summers every 10 years with a 2 degrees Celsius rise. As we can see, the best-case scenario is quite dire, and yet, due to a lack of global political will, worldwide carbon emissions are actually growing year-on-year, not declining. In fact, emissions of greenhouse gases is slated to go up by 2% this year. This sets course for a 3 degrees Celsius rise or more, resulting in irreversible, runaway climate change. 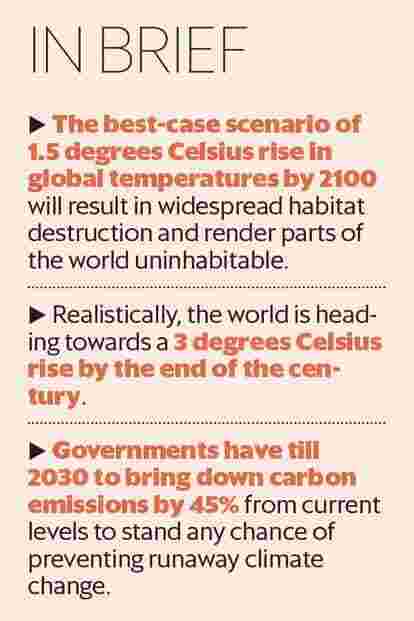 The IPCC report has given world governments a list of measures to be taken to keep global warming to 1.5 degrees Celsius, and a time frame in which to achieve it. It is 12 years. Climate change is not limited to global warming. Increasingly, and this is something that is further borne out by scientific data, it manifests itself in the form of extreme weather events. Climate shocks that were once-a-century events are becoming more frequent. The two most well known phenomena this year were the runaway wildfires and incidents of violent hurricanes and flooding in the northern hemisphere. But let’s look at the cataclysmic Kerala floods in August. The scale of the deluge that submerged large chunks of the state and displaced millions of people, as the state’s chief minister Pinarayi Vijayan mentioned, had never been seen in a lifetime. According to a Mint report from 17 October, the economic loss from the flood stood at ₹ 30,000 crore. At least 400 people had been killed and 5 million people had been displaced. While studies are still on to determine the exact cause of the flooding, while speaking to NDTV in November, the director general of India Meteorological Department, K.J. Ramesh, admitted that it was an extreme weather event triggered by climate change. “The frequency of daily rainfall up to 10-15cm has significantly increased since 1947, while the intensity of low rainfall of up to 5cm has decreased in India. This has happened because of global warming," he said. Similarly, in the case of the wildfires that devastated much of California’s forests, and, in one particularly scary instance, reduced the town of Paradise into ash in a matter of hours, climate change was the driver. According to studies, the first six months of 2018 were the hottest on record in a non-El Nino year, i.e., without that natural climate cycle that raises temperatures every year. During that time, Ouargla in Algeria’s Sahara desert recorded an all-time high of 51.1 degrees Celsius. Japan was first hit by flooding that left over 200 people dead, and then by an unprecedented heatwave which put over 30,000 people in the hospital. The same heatwave, in Europe and North America, resulted in scorching temperatures that dried out forests, turning them into unstable tinderboxes. According to a World Weather Attribution (WWA) study from earlier this year, which analysed data from weather stations across northern Europe, heatwave levels in the Arctic Circle in 2018 were unprecedented in the historical record. And then there’s the question of hunger, poverty and health challenges thrown up by climate change. The Lancet Countdown On Health And Climate Change, released in November, had a grim story to tell about 2017, the year that was its object of study. One hundred and fifty seven million more people were subjected to heatwaves in 2017 than in 2000. Due to extreme heat, 153 billion hours of work, especially in agriculture, were lost in 2017. Almost half of these losses were in India. Nick Watt, executive director, Lancet Countdown, bemoaned the lack of political will to tackle climate change in a statement. “These are not things happening in 2050 but things we’re already seeing today," he said. Not tackling climate change on an emergency footing, he says, “threatens both human lives and the viability of the national health systems it depends on". The UN’s State of Food Security and Nutrition in the World 2018 report from September, warned that extreme weather events like droughts and floods have taken back global hunger levels to a high not seen since the last decade. According to the report, hunger affected 821 million people in 2017, with more than half a billion of the world’s hungry living in Asia. At the UN’s Katowice Climate Change Conference in Poland in December, the World Health Organization (WHO) informed the participating nations that tackling emissions will result in preventing the deaths of at least a million people every year and that the economic benefits of improved health will be more than double the cost of curbing emissions. This brings us back to the IPCC report. Its recommendations are very clear. Reforestation, says the report, is essential, as is the shift to electric transport systems and greater adoption of carbon capture technologies. To meet the 1.5 degrees Celsius goal, carbon pollution needs to be cut by 45% of present levels by 2030, leading up to zero emissions by 2050. This would mean that carbon pricing needs to be 3-4 times higher than what it currently is. The report, which was handed to the world’s governments in Poland, led to a new consensus rulebook for governments to measure and verify their emission targets set under the 2015 Paris accords. This will be tallied in 2020, when nations will have to commit to tougher emission targets for 2030. However, the talks were a failure, in that four major oil producing countries, US, Saudi Arabia, Russia and Kuwait, forced the conference to water down its embrace of the IPCC findings. Australia and the US celebrated coal at the conference, and the newly elected climate science-sceptic government of Brazil withdrew its offer to host next year’s talks. There has been widespread anger and frustration at this continued denial of the severity of the problem. “The collapse of our civilizations and the extinction of much of the natural world is on the horizon," Sir David Attenborough told delegates in Poland. And one plenary speaker, 15-year-old Swedish climate activist Greta Thunberg, told the assembled dignitaries, “You say you love your children above all else, and yet you’re stealing their future in front of their very eyes…you only talk about moving forward with the same bad ideas that got us into this mess, even when the only sensible thing to do is to pull the emergency brake.You are not mature enough to tell it like it is. Even that burden you leave to us children."